In early November a small team of FROGS set about recording an old dock east of Putney Bridge, which is normally permanently flooded. It was made into a small nature reserve by building a a modern wall to retain the water, when the adjacent land was developed as a housing estate. TDP was been given a limited opportunity to record the dock because the planting will be refurbished next spring. Each day started with the opening of the sluice gates and the dramatic release of water from the previous tides, which quickly eroded a new channel across the foreshore, beyond the new wall. Much of the first day was taken up in clearing mud from the dock floor but, after a quick hosing down on the second day we could see a shiny, well-worn granite ramp or causeway, made of neatly laid large blocks. 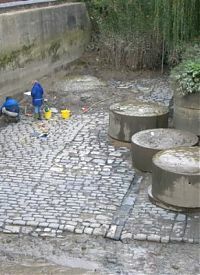 After establishing a baseline, we decided to record an area, near the steps down into the dock, in detail (at 1:20 scale), as it included some brickwork that was believed to be part of a previous Putney Bridge, demolished in the late 19th century. This would also show a sample area of the granite blocks. We also recorded a length of timber revetment, which helped to support the foundations of one of the dock walls. Another team drew an overall plan of the dock (at 1:50 scale). We were able to work much longer than on the foreshore, because we were protected from the rising tide by the modern wall (having remembered to shut the sluices). 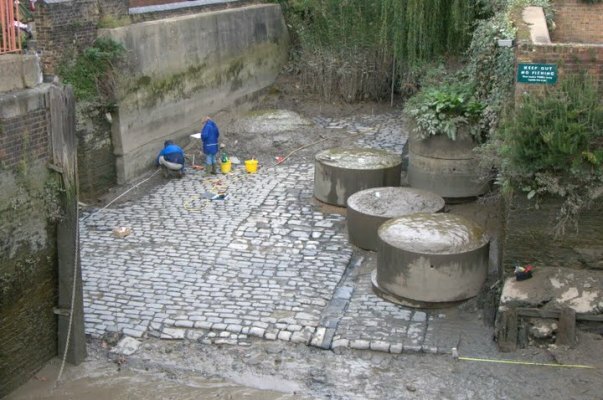 Eventually water stared to seep through the brickwork of the old dock walls and we made our retreat to watch the Thames slowly rise above the top of the modern wall and create a dramatic waterfall, as the dock re-filled. However, the spectacle was somewhat dimmed by the knowledge that we would start the next day with draining it all out again. Click here to read more about this site and see some more pictures.